DOHA: Qatar’s decision to commit to sweeping labor reforms may head off an international investigation into its treatment of hundreds of thousands of foreign workers, but rights groups wonder if the 2022 World Cup host will stick to its pledges. Last week the International Labor Organization said Qatar had agreed to cooperate on a range of reforms – from allowing workers freedom to leave the country and change jobs without their employer’s permission, to establishing a minimum wage and a fund to guarantee late wages. These are the most far-reaching labor reforms yet agreed to by Qatar, which hopes to burnish its image abroad at a time when its Arab rivals have been boycotting it as a global financier of militant groups, a charge it denies. The government has not responded to requests for detailed comment on the reforms and how it planned to implement them. On Twitter, the government communications office said Qatar “reaffirmed its commitment in developing laws in line with international labor standards and the guidance of ILO,” and would ensure that “all workers rights are secure”. Since winning its 2022 World Cup bid, partly on the basis it would positively rebrand a region in turmoil, Qatar’s tournament has faced allegations of vote-buying – which it denies – concern over its hot climate and, since June, its diplomatic dispute with Saudi Arabia and three other Arab nations. While Qatar has welcomed labor and rights groups into the country to work with it on reform, criticism of its labor conditions has added to its image problems. Rights and labor groups have campaigned for years against the kafala system, which forces Qatar’s 1.6 million mainly Asian workers to seek their employer’s consent to change jobs or leave the country – measures which the groups say leaves workers open to exploitation. With just 300,000 citizens, the world’s largest liquefied natural gas exporter has imported workers from countries such as Nepal and Bangladesh to build up its infrastructure in time for 2022. Now the dispute with the other Arab states threatens to hurt Qatar’s economy and rights groups fear that workers with few protections will be vulnerable to job cuts or reduced wages. A Filipina housemaid, who asked to remain anonymous, said her wages had increasingly been delayed in recent months, hurting her ability to send remittances back home. 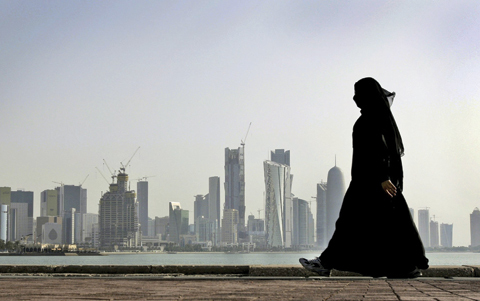 When the arrears hit two months, she considered leaving Qatar altogether, but like other workers subject to travel restrictions, she feared her employer would reject the request. Qatar’s ILO commitments come just before a Nov 8 meeting at which the agency will vote on whether to open a commission of inquiry, a rare sanction reserved for countries which it considers the worst offenders. A commission now looks unlikely after the ILO on Tuesday released a draft resolution which it plans to present at the meeting. It calls for working with Qatar on “technical cooperation” and dropping the long-standing labour complaint – though this course of action would need to be agreed by consensus or in a vote. Rights groups like Amnesty International and Human Rights Watch, however, point out that the government has said little about how and when it will implement the reforms. In one of the few official communications on the reforms, Qatar’s state news agency reported last week that the cabinet had agreed to amend a law on the “entry and departure of expats”, though it did not specify if travel restrictions would be completely ended, a key demand for labor and rights groups. Workers recall how a similar pledge to abolish exit visas, announced in 2015, ultimately had little impact on the system. “They made this big announcement that there isn’t going to be an exit permit … and eventually nothing happened, and all they did is change the name from exit permit to notification,” said one resident who frequently applies for travel. Qatar last year amended its sponsorship system to allow workers who have completed contracts to change jobs freely, and to impose fines on businesses that confiscate employees’ passports. Rights groups however say workers still suffer from many of the same abuses, with contracts changed upon arrival and freedom of movement limited. “The fear is that they won’t follow up on the pledges and they will stall. That they are looking to buy time, and until we actually see one concrete step as evidence of their good faith, I think those fears are likely to remain,” said Nicholas McGeehan, a human rights researcher who focuses on Gulf labor.